Where Dogs Come to Relax and Have Fun! Schedule a Tour!See Why Dogs Love Us! Our Guests Play ALL Day! Nobody offers more supervised playtime! Nobody offers more supervised playtime! We are repeatedly told that we are the prettiest place around. Tour us last and you will love us for it! 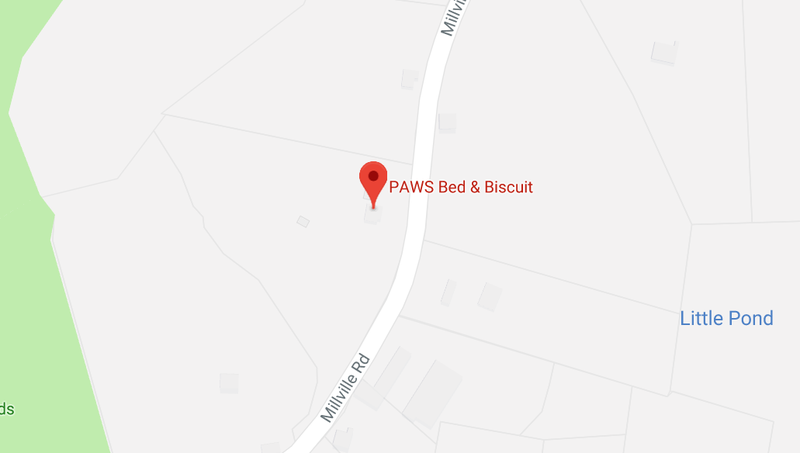 A one-stop destination for your dog. From daycare and boarding to grooming and training, PAWS will pamper your pup! Like PAWS Bed & Biscuit on Facebook! Our passion is dogs. We are true dog lovers and every aspect of PAWS Bed & Biscuit is built around creating the best experience for your furry family members. My 9 month old went to Paws yesterday for his 1st day of doggie day care and loved it. He cried as we drove away and passed by one of his new playmates. Within an hour of getting home he was out like a light. Best night sleep!!! Dustin can’t wait to go back next week. I highly recommend Paws. The country setting is so perfect and the staff/owners are welcoming and responsive to your questions and needs. So happy to have a safe place for my pup and only few minutes away from home. Thanks Paws! We have been clients of Paws since 2012 when we got our oldest dog. Paws has been a great place to send the dogs for daycare and for boarding. Our younger dog has had some Issues. The staff at Paws has been great about working with us to help her adjust and resolve the issues. Highly recommend Paws. I never worry when I travel because I know they will be in good hands. My dog Nala had her first day there today! She was so tired when she came home! She must have met some new furry friends and played all day! Can’t wait to have her there again! People who work there are so nice and sensitive to the needs of your fur baby!